The evidence on the association between omega-3 consumption and epileptic seizure is inconsistent. Therefore, we have conducted this systematic review to clarify the possible relationship. Original articles were searched in electronic databases (PubMed, Scopus, Google Scholar, Cochrane, and Ovid) and by reviewing the reference lists of retrieved articles. The main evaluated outcome was the epileptic seizures. We included the English language studies that reported the original data on the effect of omega-3 on epileptic human patients. We included the nine articles with 230 patients in the present systematic review. The mean ± standard deviation age of them was about 31.01 ± 14.99 years. The average of study duration was 22 ± 15.27 weeks. Omega-3 fatty acid supplements were defined as the sum of docosahexaenoic acid (DHA) and eicosapentaenoic acid (EPA) (1100 mg/d); as the sum of EPA, DHA, and alpha-linolenic acid (5 g/d); and as the sum of EPA alone (565 mg/d) in different studies. Among the nine studies, four studies reported a significant positive association between omega-3 fatty acids and epileptic seizures. However, power and quality of these studies are low, and we cannot consider the beneficial effect of omega-3 on seizures. In addition, five studies did not reveal any significant effect. Majority of the included studies did not show a significant association between omega-3 and epileptic seizure in epileptic patients, but further studies are necessary. It is controversial whether omega-3 fatty acids can produce positive effects on epileptic patients or not. Epilepsy is the brain disorder and a common neurological disorder that develops by recurrent seizures.,,,,, It affects the people of all ages, but it is prevalent in the people who are younger than 20 years and people over the age of 60 years. Its prevalence in developing countries is higher than that of the developed ones., In general, this affects 70 million people worldwide. Lately, nonpharmacological treatment of epilepsy and the role of omega-3 fatty acids were investigated. Omega-3 fatty acids receive from diet or supplements and is necessary for normal brain growth and process.,,, The main part of omega-3 fatty acids in the brain structure is docosahexaenoic acid (DHA) that is composed of 10%–20% of total fatty acids. Alpha-linolenic acid (ALA) and eicosapentaenoic acid (EPA) form <1% of them. Studies indicated that the level of omega-3 fatty acids in patients with epilepsy decreased remarkably. ALA is the main cause of neurological disorders including unusual points in the myelin, nerve endings, and endoplasmic reticulum. Some studies reported that omega-3 fatty acid supplementation could suppress the epileptic seizures while the others did not confirm. Animal studies reported that omega-3 fatty acids could elevate the seizure. Others shown that omega-3 could play a role as an inhibitor of messenger-regulated protein kinase  and had neuroprotective roles. DHA derivatives such as neuroprotectin D1 (NPD1) have protective role in various inflammatory reactions such as epilepsy, inhibit cell death, and suppress the cytokines. In addition, it may decrease the synthesis of energetic radicals and ameliorate the mitochondrial function.,,,, In addition, it may affect the seizures through decreasing the cleavage of brain membrane phospholipids and increase them. It has been proposed that omega-3 fatty acids can modulate calcium and sodium channels and reduce the neuron membrane stimulation., However, because of inconsistent results and disagreement of articles in this field, we need a comprehensive study. The purpose of this systematic review is to summarize the available information and clarify the relationship between omega-3 fatty acid supplementation and epileptic seizure in epileptic patients. We searched PubMed, Scopus, Ovid, Google Scholars and Cochrane up to May 2015 using the following Medical Subject Headings and keywords without restrictions of publication date: (“Epilepsy” OR “seizures” OR “convulsion” OR “seizure*”) AND (“Fatty Acids, Omega-3” OR “Eicosapentaenoic Acid” OR “Fish Oils” OR “alpha-Linolenic Acid” OR “Fatty Acids” OR “Fatty Acids, Unsaturated” OR “Fatty Acids, Essential” OR “Docosahexaenoic Acids” OR “N-3 fatty acid” OR “ALA” OR “DHA” OR “EPA” OR “Linolenic acid” OR “PUFA” OR “Marine omega-3 fatty acids” OR “E-EPA” OR “Long chain fatty acids” OR “Ethyl eicosapentaenoic acid”). After primary search and removing the duplicate articles, two researchers checked the tittle and abstracts of all articles. Relevant articles were checked by full text. Excluded studies and vague ones were reviewed by the third researcher. Furthermore, the reference lists from the detected articles were reviewed to distinguish additional relevant studies. Finally, nine articles were selected and assessed in the present study. The selection process for studies is shown in [Figure 1]. The present systematic review was performed based on the Preferred Reporting Item For Systematic reviews and Meta-analysis statement recommendation and has been registered by PROSPERO (ID = CRD42015020389). We included English language studies without any time restriction that reported original data on the effect of omega-3 on epileptic seizure in epileptic patients. Studies in which omega-3 was an ingredient of supplement. The included studies were summarized by two independent researchers. We extracted the first author's last name, publication year, study subjects and demographic traits, study design, study size, type, and dosage of omega-3 fatty acids, and duration of the study [Table 1]. We compared the outcomes between omega-3 intervention group and the control group if available. For one study that reported low- and high-dose, we compared them with placebo group. Disagreements on data extraction were examined by the third researcher. Two investigators assessed the quality of included studies using the Jadad criteria. This score includes 5 points (5 is the highest quality). This allocated 2 points for randomization (1 point for the mention of randomization and the other for the appropriate randomization method). This criteria deduct 1 point if the method of randomization is not appropriate, 2 points for blinding (one point for the mention of blinding and the other for the appropriate method of blinding and 1 point if the method of blinding is not appropriate), and 1 point for the subject's fate. It means that if the patients do not complete the study, they are eliminated and the reason is explained. In brief, the titles of 6481 articles were reviewed. Then, 317 of them were checked by titles and abstracts, and 72 full-text papers were screened. Finally, nine articles (eight clinical trials and one cohort study) met the inclusion criteria. Characteristics of the included studies are shown in [Table 1]. The seven clinical trial articles were published between 2002 and 2015 that included 205 patients with epilepsy. About 52.3% of them were female and 49.3% were male. The mean age was about 31.01 ± 14.99 years. Among these articles, five studies investigated the effect of fish oil ,,,, and two studies assessed fish oil plus Vitamin A and Vitamin D., Omega-3 fatty acid supplements were defined as the sum of DHA and EPA (1100 mg/d); as the sum of EPA, DHA, and ALA (5 g/d); and as the sum of EPA alone (565 mg/d) in different studies. In one study, fish oil was used for intervention group (240 mg DHA and 360 mg EPA plus Vitamin E) and corn oil for control group. The average of study duration was 22 weeks. Design of two studies was crossover with washout duration. Two studies investigated meal enriched with omega-3,, and the others investigated supplement therapy.,,,,,, In a cohort study, the participants received multivitamins plus carnitine. In addition, they received a meal with certain recipe for 1 month and then added fish oil to it. DeGiorgio et al. investigated low- (1080 mg/d) and high-dose (2160 mg/d) fish oil on epileptic patients with the mean age of 33 ± 10.33 years for 42 weeks. Nearly 25% of participants in low-dose fish oil group indicated a 50% reduction in epileptic seizure frequency as well as 15% of patients in high-dose fish oil group indicated 50% reduction in epileptic seizure compared with placebo. Almost 10% of participants were seizure free with low-dose fish oil during the intervention. In addition, no association was found between fish oil and seizure severity score. Schlanger et al. have shown that bread enrichment with omega-3 supplement (5 g) contained 46% DHA, 18% EPA, and 1% ALA, and 100 IU Vitamin E could alleviate the seizures in epileptic patients with the mean age of 19 years for 24 weeks. However, they assessed only five patients with no control group and a Jadad score of 0. This cannot be clearly interpreted as a proof of positive effect. Yuen et al. assessed the effect of fish oil on seizures during 12 weeks of intervention. They reported that patients (with the mean age of 39 years in intervention group and 38 years in placebo group) who took capsules containing 1000 mg of fish oils (with 171 mg EPA and 112 mg DHA and <100 IU Vitamin A and <40 IU Vitamin D) experienced less seizures during the first 6 weeks. However, this reduction was not consistent for the second 6 weeks. Bromfield et al. investigated epileptic patients with a mean age of 36 years in omega-3 group and patients with a mean age of 38 years in placebo group for 4 weeks. They showed that the patients in the intervention group (polyunsaturated fatty acid [PUFA] supplement: EPA plus DHA, 2.2 mg/day in a 3:2 ratio) did not experience the reduction in seizure. The median seizure frequency was increased to 6% in PUFA and decreased to 12% in placebo group (P = 0.21). Overall, there is no remarkable evidence in this field. In a 30-week crossover study, patients (mean age of 41.5 years) received eight capsules contain 1200 mg fish oil per day (216 mg EPA + 144 mg DHA). Hence, they received totally 2880 mg of omega-3 fatty acids/day. Findings showed that seizure frequency increased to 11% in intervention group and 14% in placebo group (P = 0.051). Hence, no reduction was found in seizure frequency. Seizure severity was measured by the National Hospital Seizure Severity Scale. The mean score decreased from 8.55 at baseline to 7.55 in fish oil group and from 8 to 7.57 during the placebo time. However, this reduction was not significant. Yuen et al. assessed the effect of EPA (1000 mg of EPA and 20 mg mixed tocopherols) on epileptic patients with a mean age of 49 years for 12 weeks. The median of seizure frequency decreased from 15 to 11, but it was not statistically significant (P = 0.26). Thus, they could not show a significant relationship between consumption of EPA supplement and seizure frequency. Patients in a study of Puri et al. received three capsules contain 1000 mg fish oil (with 171 mg EPA, 112 mg DHA, <100 IU Vitamin A and <40 IU Vitamin D) twice a day for 12 weeks. The mean age of patients in intervention and placebo group was 50.7 ± 13.6 years and 40.5 ± 12.0 years, respectively. The results showed that omega-3 supplementation might relate to decrease of membrane phospholipid separation in patients' brain and metabolism of brain energy development and membrane phospholipid enhancement. However, it was not statistically significant. For this purpose, they reported some biochemical changes such as decrease in phosphodiester percentage (by an average of 3.75 ± 2.81), increase in gamma-nucleotide triphosphate percentage (by an average of 1.73 ± 2.41), and increase in the broadband component (BBC) percentage (by an average of 13.56 ± 7.74) to evaluate the brain changes that might be associated with epilepsy. Finally, there was no correlation between epileptic seizures and biochemical changes. Dahlin et al. investigated a meal recipe plus fluid fish oil (1–2 g, 4 times a day) in 25 children with a mean age of 6.3 ± 4.2 for 12 months. Sixteen of 25 children after 3 months, 15 of 24 ones after 6 months, and 12 of 19 children after 12 months experienced >50% reduction in seizures. Serum level of EPA and linoleic acid increased, arachidonic acid (AA) decreased and DHA increased insignificantly. However, no correlation was found between change in serum fatty acids and seizure response. Reda et al. used 3-mL daily dose of 1200 mg fish oil that provides 240 mg DHA and 360 mg EPA plus Vitamin E for intervention group and 3 mL of corn oil daily for control group in their study. The mean age of the participants in intervention group was 6.9 ± 2.5 years and 6.6 ± 2.4 years in control group. After 12 weeks, seizure frequency and severity decreased significantly in intervention group. Considering the minimal efficacy of supplementation in the placebo group, it seems that omega-3 PUFAs increased the seizure threshold in epileptic patients and may control achieving seizure. This is the first systematic review that assessed the relationship between omega-3 supplementation and epileptic seizures. The results of the studies reported an inconsistent effect of omega-3 fatty acids on epileptic seizures. DeGiorgio et al. claimed that low-dose fish oil was a safe and low-cost method for the reduction of seizures and attenuation of cardiovascular health in people with epilepsy. Schlanger et al. illustrated the mechanism by neuroprotection role, or changes in AA concentrations. EPA inhibits the AA metabolism by affecting the substrate for cyclooxygenase and lipoxygenase enzymes. However, studies that reported positive effect of W3 on seizures noted the time of seizures per month manually, this manner may cause information bias. In addition, the small sample size and short duration of intervention cannot obtain the decisive results. Among the studies that did not demonstrate any relationship, Puri et al. used brain spectrum resonances and BBC for between-group comparisons of seizure changes, which can increase the reliability of the results and the design of the study. Another study applied the National Hospital Seizure Severity Scale for seizure assessment; moreover, the duration and crossover design of the study were considered as the positive points for the mentioned study. By the way, this study did not show the significant effects of omega-3 on seizure frequency and severity that high dosage of omega-3 can be the cause of it. An open-label PUFA trial was designed after one randomized double-blind study and the participants completed the Quality of Life in Epilepsy form to assess the overall health. However, they found no convincing effects of omega-3 on seizures. Yuen et al., in 2012, conducted one study on EPA supplementation and found that it has no effect on seizures. One cohort study with sufficient follow-up period found no correlation between omega-3 and seizures. The effect of omega-3 on epileptic seizures was determined in animal studies, but it is controversial in humans. According to previous studies, there are two different pathways regarding the effect of omega-3 on epileptic seizure. The first mechanism is that DHA regulated glutamate transporters (GLTs) such as GLT1, glutamate aspartate transporter, and excitatory amino acid transporter 1. It seems that in epileptic patients the transporters deregulated, and glutamate was accumulated through the seizures. Besides, NPD1 is a DHA derivate that carries out the protective bioactivity in CNS. It is proposed that NPD1 may increase anti-apoptotic proteins and reduce the pro-apoptotic ones. As well as, the modulating effect of astrocytes and cytokines that were the main participants in epilepsy may be downregulated by NPD1. Another recommended mechanism is the anti-inflammatory effect of omega-3, through the reduction of pro-inflammatory markers such as C-reactive protein or tumor necrosis factor alpha and increments of the anti-inflammatory agents such as interleukin 10 and transforming growth factor-alpha. As strength, this is the first systematic review on omega-3 and epileptic seizure. However, some limitations also exist: nonadjustment of energy in most of the trials, inclusion of nonrandomized or nondouble-blind trial, uncontrolled health status, drug abuse, alcohol, and other potential factors in most trials that cause heterogeneity within the results. Majority of the included studies did not show significant association between omega-3 and epileptic seizure in epileptic patients. However, further studies are necessary. Hence, a few papers reported the certain effect, it is controversial whether omega-3 fatty acids can produce positive effects in epileptic patients or not. Hence, we require more comprehensive data, with large sample size and long follow-up period to clarify the effects and determine the mechanisms. Cunnane SC, Musa K, Ryan MA, Whiting S, Fraser DD. Potential role of polyunsaturates in seizure protection achieved with the ketogenic diet. Prostaglandins Leukot Essent Fatty Acids 2002;67:131-5. Forsgren L. Epidemiology and prognosis of epilepsy and its treatment. The Treatment of Epilepsy. Malden: Blackwell Science Oxford; 2004. p. 21-42. Forsgren L, Beghi E, Oun A, Sillanpää M. The epidemiology of epilepsy in Europe – A systematic review. Eur J Neurol 2005;12:245-53. Hauser WA, Annegers JF, Kurland LT. Incidence of epilepsy and unprovoked seizures in Rochester, Minnesota: 1935-1984. Epilepsia 1993;34:453-68. Kotsopoulos IA, van Merode T, Kessels FG, de Krom MC, Knottnerus JA. 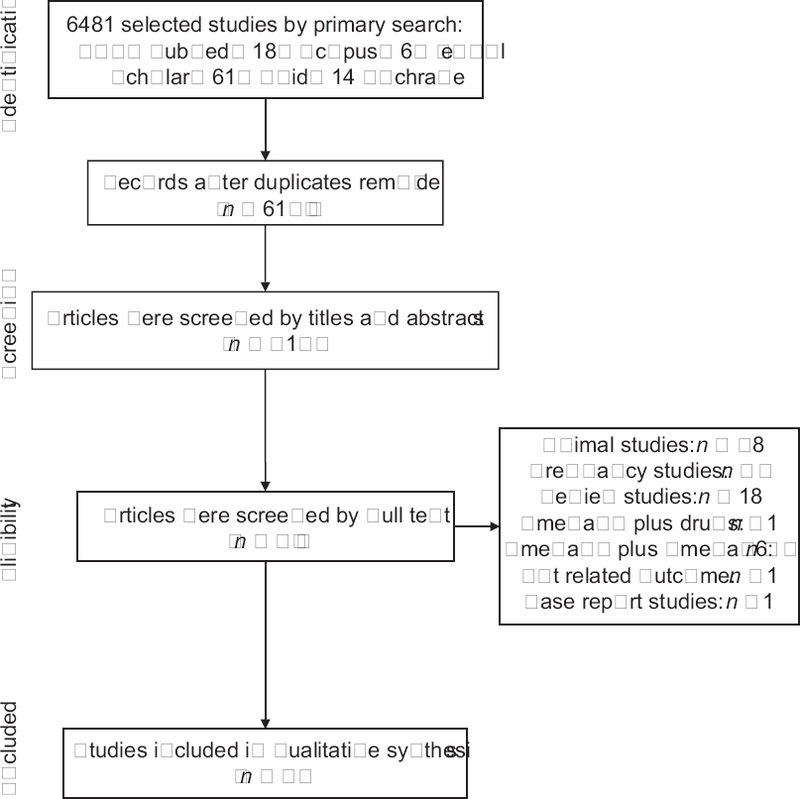 Systematic review and meta-analysis of incidence studies of epilepsy and unprovoked seizures. Epilepsia 2002;43:1402-9. Preux PM, Druet-Cabanac M. Epidemiology and aetiology of epilepsy in sub-Saharan Africa. Lancet Neurol 2005;4:21-31. Scorza CA, Cavalheiro EA, Scorza FA. The prescription of omega-3 fatty acids for people with epilepsy by Brazilian epileptologists: We know the goal, but do we know the price? Epilepsy Behav 2013;27:422-3. Ngugi AK, Kariuki SM, Bottomley C, Kleinschmidt I, Sander JW, Newton CR. 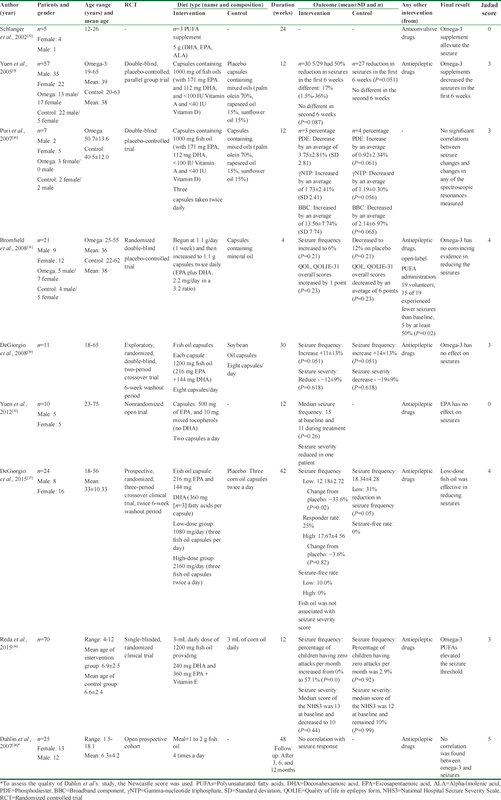 Incidence of epilepsy: A systematic review and meta-analysis. Neurology 2011;77:1005-12. Yuen AW, Sander JW, Fluegel D, Patsalos PN, Bell GS, Johnson T, et al. Omega-3 fatty acid supplementation in patients with chronic epilepsy: A randomized trial. Epilepsy Behav 2005;7:253-8. Okuyama H, Kobayashi T, Watanabe S. Dietary fatty acids – The N-6/N-3 balance and chronic elderly diseases. Excess linoleic acid and relative N-3 deficiency syndrome seen in Japan. Prog Lipid Res 1996;35:409-57. Horrocks LA, Yeo YK. Health benefits of docosahexaenoic acid (DHA) Pharmacol Res 1999;40:211-25. Connor WE, Neuringer M, Reisbick S. Essential fatty acids: The importance of n-3 fatty acids in the retina and brain. Nutr Rev 1992;50:21-9. Mirnikjoo B, Brown SE, Kim HF, Marangell LB, Sweatt JD, Weeber EJ. Protein kinase inhibition by omega-3 fatty acids. J Biol Chem 2001;276:10888-96. McNamara RK, Carlson SE. Role of omega-3 fatty acids in brain development and function: Potential implications for the pathogenesis and prevention of psychopathology. Prostaglandins Leukot Essent Fatty Acids 2006;75:329-49. DeGiorgio CM, Scorza FA. Epilepsy and behavior: 15th anniversary research on omega-3 fatty acids for epilepsy. Epilepsy Behav 2014;40:124-5. Bourre JM, Pascal G, Durand G, Masson M, Dumont O, Piciotti M. Alterations in the fatty acid composition of rat brain cells (neurons, astrocytes, and oligodendrocytes) and of subcellular fractions (myelin and synaptosomes) induced by a diet devoid of n-3 fatty acids. J Neurochem 1984;43:342-8. Lauritzen I, Blondeau N, Heurteaux C, Widmann C, Romey G, Lazdunski M. Polyunsaturated fatty acids are potent neuroprotectors. EMBO J 2000;19:1784-93. Bazan NG. Homeostatic regulation of photoreceptor cell integrity: Significance of the potent mediator neuroprotectin D1 biosynthesized from docosahexaenoic acid: The Proctor Lecture. Invest Ophthalmol Vis Sci 2007;48:4866-81. Bazan NG, Molina MF, Gordon WC. Docosahexaenoic acid signalolipidomics in nutrition: Significance in aging, neuroinflammation, macular degeneration, Alzheimer's, and other neurodegenerative diseases. Annu Rev Nutr 2011;31:321-51. Bough KJ, Rho JM. Anticonvulsant mechanisms of the ketogenic diet. Epilepsia 2007;48:43-58. Leaf A. The electrophysiologic basis for the antiarrhythmic and anticonvulsant effects of n-3 polyunsaturated fatty acids: Heart and brain. Lipids 2001;36:S107-10. Bernardino L, Ferreira R, Cristóvao AJ, Sales F, Malva JO. Inflammation and neurogenesis in temporal lobe epilepsy. Curr Drug Targets CNS Neurol Disord 2005;4:349-60. Seebungkert B, Lynch JW. Effects of polyunsaturated fatty acids on voltage-gated K+and Na+channels in rat olfactory receptor neurons. Eur J Neurosci 2002;16:2085-94. Xiao YF, Ma L, Wang SY, Josephson ME, Wang GK, Morgan JP, et al. Potent block of inactivation-deficient Na+ channels by n-3 polyunsaturated fatty acids. Am J Physiol Cell Physiol 2006;290:C362-70. Vreugdenhil M, Bruehl C, Voskuyl RA, Kang JX, Leaf A, Wadman WJ. Polyunsaturated fatty acids modulate sodium and calcium currents in CA1 neurons. Proc Natl Acad Sci U S A 1996;93:12559-63. Xiao Y, Li X. Polyunsaturated fatty acids modify mouse hippocampal neuronal excitability during excitotoxic or convulsant stimulation. Brain Res 1999;846:112-21. DeGiorgio CM, Miller PR, Harper R, Gornbein J, Schrader L, Soss J, et al. Fish oil (n-3 fatty acids) in drug resistant epilepsy: A randomised placebo-controlled crossover study. J Neurol Neurosurg Psychiatry 2015;86:65-70. Dahlin M, Hjelte L, Nilsson S, Amark P. Plasma phospholipid fatty acids are influenced by a ketogenic diet enriched with n-3 fatty acids in children with epilepsy. Epilepsy Res 2007;73:199-207. DeGiorgio CM, Miller P, Meymandi S, Gornbein JA. n-3 fatty acids (fish oil) for epilepsy, cardiac risk factors, and risk of SUDEP: Clues from a pilot, double-blind, exploratory study. Epilepsy Behav 2008;13:681-4. Puri BK, Koepp MJ, Holmes J, Hamilton G, Yuen AW. A 31-phosphorus neurospectroscopy study of omega-3 long-chain polyunsaturated fatty acid intervention with eicosapentaenoic acid and docosahexaenoic acid in patients with chronic refractory epilepsy. Prostaglandins Leukot Essent Fatty Acids 2007;77:105-7. Bromfield E, Dworetzky B, Hurwitz S, Eluri Z, Lane L, Replansky S, et al. Arandomized trial of polyunsaturated fatty acids for refractory epilepsy. Epilepsy Behav 2008;12:187-90. Schlanger S, Shinitzky M, Yam D. Diet enriched with omega-3 fatty acids alleviates convulsion symptoms in epilepsy patients. Epilepsia 2002;43:103-4. Yuen AW, Flugel D, Poepel A, Bell GS, Peacock JL, Sander JW. Non-randomized open trial of eicosapentaenoic acid (EPA), an omega-3 fatty acid, in ten people with chronic epilepsy. Epilepsy Behav 2012;23:370-2. Reda DM, Abd-El-Fatah NK, Omar Tel-S, Darwish OA. Fish oil intake and seizure control in children with medically resistant epilepsy. N Am J Med Sci 2015;7:317-21. Yehuda S, Carasso RL, Mostofsky DI. Essential fatty acid preparation (SR-3) raises the seizure threshold in rats. Eur J Pharmacol 1994;254:193-8. Bazan NG, Musto AE, Knott EJ. Endogenous signaling by omega-3 docosahexaenoic acid-derived mediators sustains homeostatic synaptic and circuitry integrity. Mol Neurobiol 2011;44:216-22.